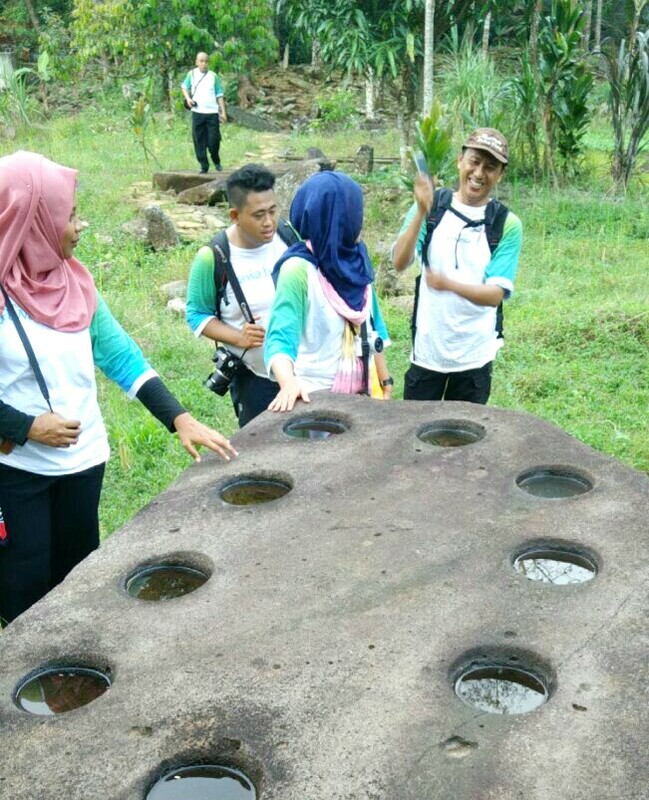 Bramasole: Ciletuh Amazing Geopark : Awaken Your Five Senses Journey. 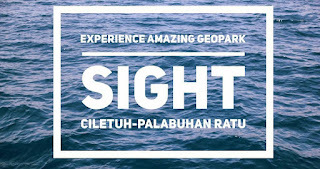 Ciletuh Amazing Geopark : Awaken Your Five Senses Journey. Have you ever made a journey that truly enliven the five senses? If you have never felt a travel journey like that, then it is time for you to directed your compass trip to an area that, when viewed from the sky, resemble a horseshoe facing directly to the Samudera Hindia. The area called #GeoparkCiletuhPalabuhanRatu is located in the southwest of #Sukabumi regency, West Java, Indonesia. 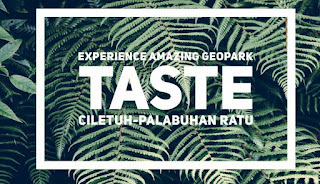 Geopark Ciletuh-Palabuhan Ratu is easily accessible from the nearest big cities like Jakarta, Bandung, Bogor, and Sukabumi. For the uninitiated, Geopark is a sustainable area development management concept that harmonizes geological, biological, and cultural diversity through conservation principles and spatial plans. Geopark is a geographical region that has a leading geological heritage site. Geopark Ciletuh-Palabuhan Ratu itself has a rare and unique geodiversity. Even some experts say that the area is the First Mainland in West Java. 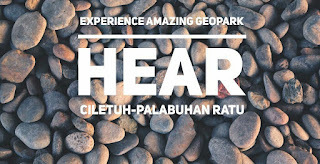 Geopark Ciletuh-Palabuhan Ratu is designated as National Geopark by the Indonesian National Committee for UNESCO. 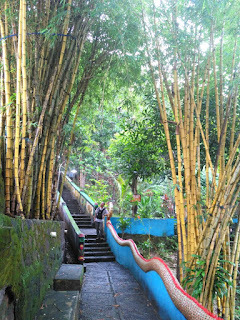 The beauty of the landscape of Geopark Ciletuh-Palabuhan Ratu is represented by several points, such as in the southern part of which is very monumental so called 'Amphitheater', while in the middle there is Jampang Plateau known as 'Plato Jampang' and in the north there is the existence of gesyer and some hot springs. Now, let's begin the journey to awaken the five senses. The natural wonder that happens every day but often we taken for granted for the beauty is the moment when the sun rises and sinks. 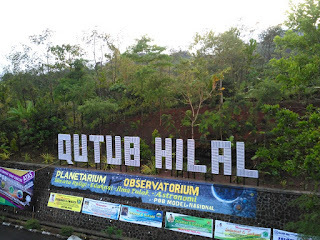 When we arrived at Geopark-Ciletuh Palabuhan Ratu area, the clock still showed at 04:30 West Indonesia time, we rushed to Qutub Hilal to capture the beauty of the sky at sunrise. Qutub Hilal or POB Cibeas is second Pos Observasi Bulan (POB) after POB Cidadap, located in the area of Simpenan. POB Cibeas was inaugurated in 2012 by the Regent of Sukabumi Mr. Drs. H. Sukmawijaya, MM. 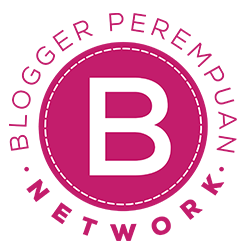 Since its establishment in 2012, POB Cibeas is only used for Hisab Rukyat activities especially Rukyat Hilal in every determination of the beginning of the month of Hijriyah. The existence of POB Cibeas is very strategic that stands on the Loji Beach with its very beautiful view focused on the stretch of beach that extends to the end of west sky. This makes POB Cibeas able to directly witness the natural phenomenon every day at sunset (Sun-set) and Moon (Moon-Set) at the beginning of Hijriyah month. The sky painted with a spark of pink, a dash of golden yellow, and began to burst when we arrived at the top of the sky observation post. Some of us were mesmerized by the beauty of Loji Beach in the morning. After enjoying the painting in the eastern sky, we rushed down and planned to go to the Vihara. Vihara Nam Hai Kwan Se Im Pu Sa. Entering the gate of the monastery, which has another name the Temple of Goddess Kwan Im and Vihara Loji, visitors will find a seven-headed dragon statue with its tail extending upwards. 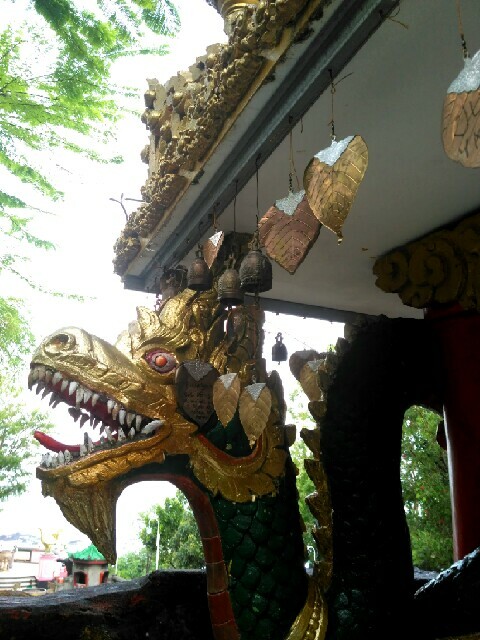 This dragon carving has a characteristic gold color with a unique Thai carving style because the vihara was built on the initiative of Thai citizen named Anotahi Kamonwathin. The most eye-catching interest of the monastery is the detail of its distinctive colors. Red, golden yellow, are two colors that are so synonymous with the temples. 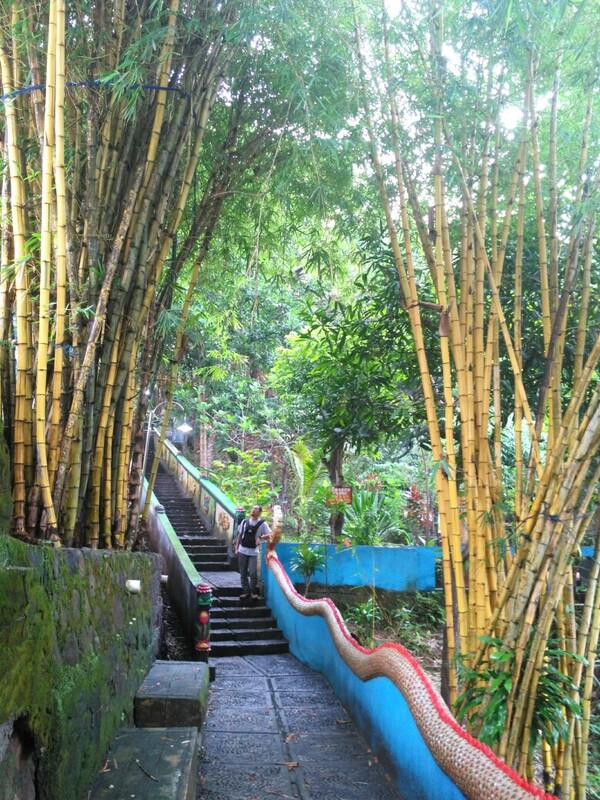 To be able to enjoy all the beauty of this temple, you have to climb dozens of stairs while lay down your hand to the dragon body that became the handle of the ladder. 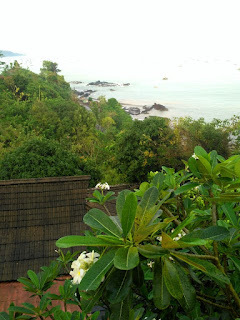 Arriving on the top, take a deep breath and then exhale all the tension of your mind because you will be greeted by a breathtaking view of Loji Beach from a height. Various ornaments in the temple woke the eye nerves. Rows of red candles. 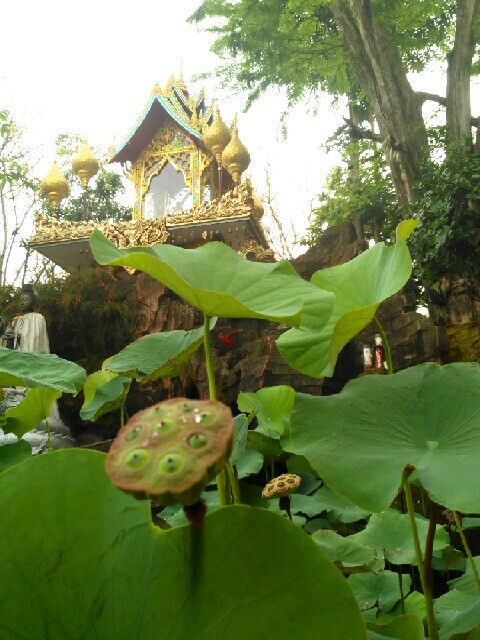 Green leafy lotus leaves in the pond, and red copper metal leaves that hung as a prayer request to the gods. 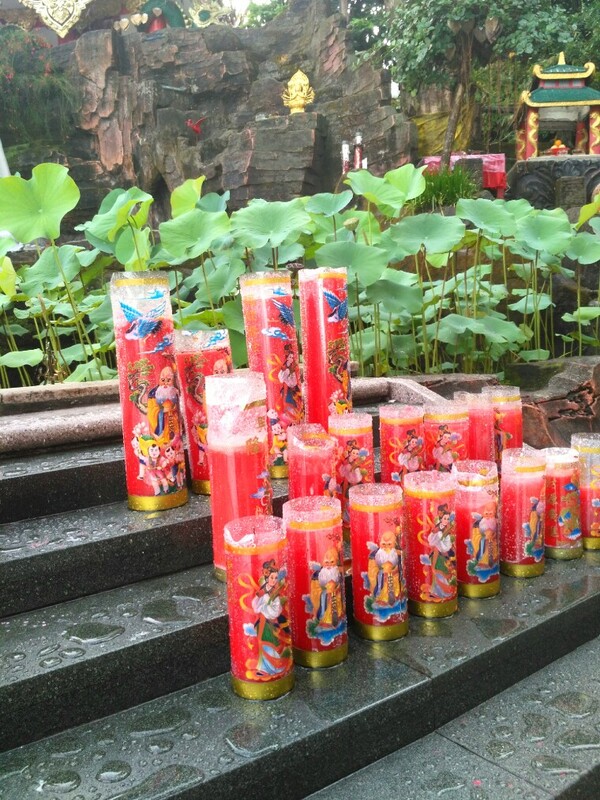 On the main altar there is a statue of Sun Go Kong and his teacher. From this altar the view of the sea has begun to appear. 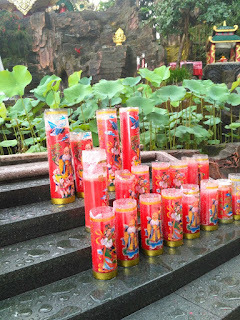 This monastery also has an unusual altar. If the monastery generally displays gods and goddesses but here is the altar of Semar, altar Prabu Siliwangi, and the most unique is a special altar for Nyi Roro Kidul. 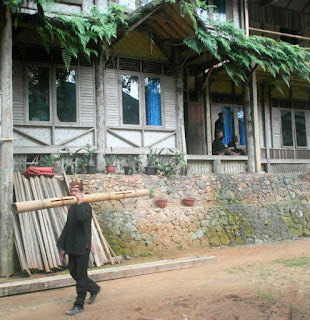 Altar Nyi Roro Kidul is made special in a wooden building that resembles a house. The altar is equipped with a bed and dressing table dedicated to the ruler of the South Sea. The altar is also dominated by green, the color that characterizes Nyi Roro Kidul. Uniquely again, inside the altar there is a desk work of President Soekarno and his photograph. The view of the Loji Beach from the heights, the ornaments of worship in the monastery, and the colorful plants around the temple, all of them really provide experience for my eyes, which then weave it in a memory of the first day trips story in Geopark Ciletuh-Palabuhan Ratu. 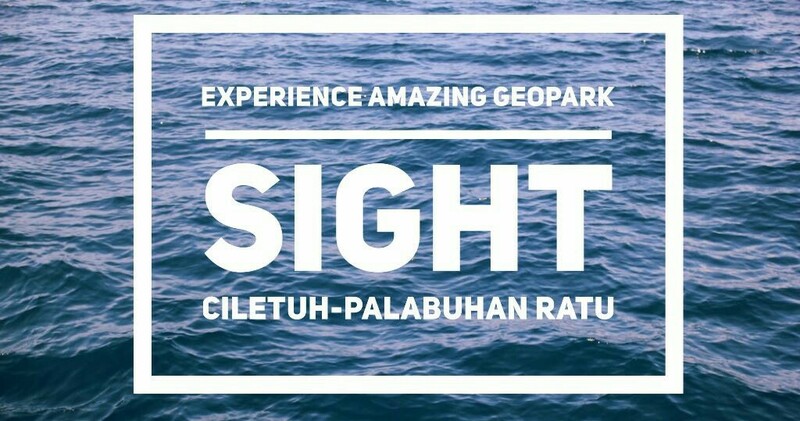 Next, let's continue the adventure of waking up the other five senses in #CiletuhPalabuhanRatuGeopark. 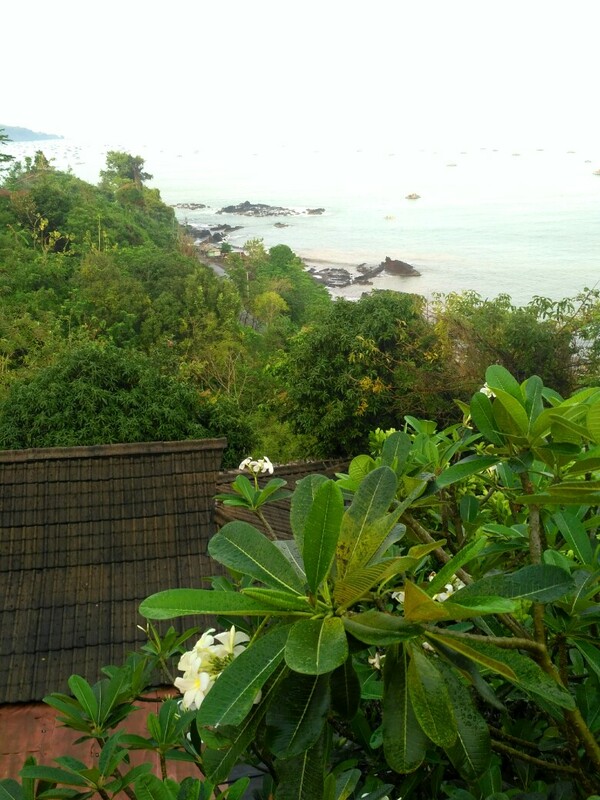 The typical sound of the waves of Cimaja Beach breaks the morning silence. 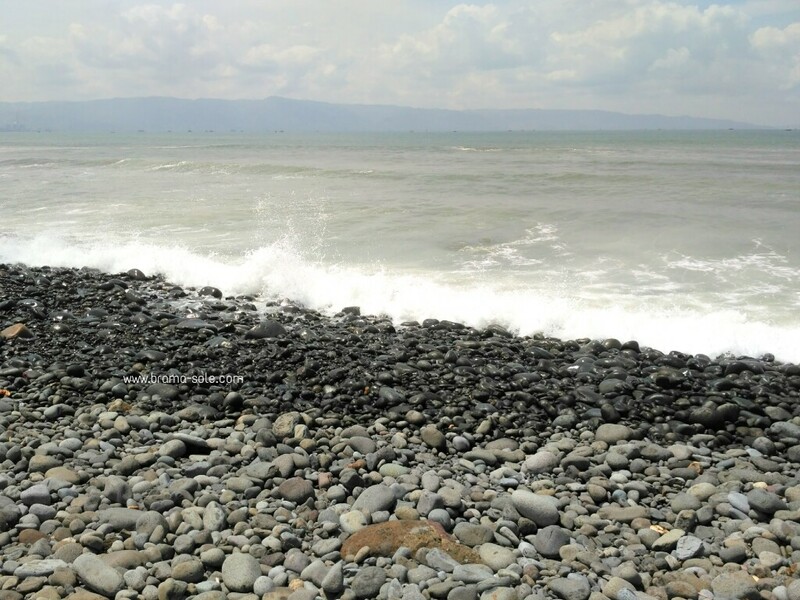 There is something strangely unique from the sound of the waves at Cimaja Beach. I walked closer to the shore to find out what makes the differences of the sound of the waves. 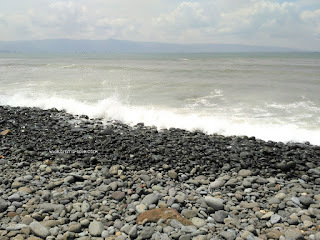 I found the uniqueness of Cimaja Beach, which is the lined coast of alluvial plains covered in round and oval-shaped rocks. It is these rocks that make a crunching sound when exposed to the waves. I came to Cimaja Beach coincide with the international surfing competition which is part of the series of Amazing Geopark Adventure Tourism 2017 or known as #AGAT2017. This is the first time I watched surfing sports. The excitement of the opening of the event which took place on Saturday, October 14, 2017 yesterday was still memorable. Clamorous audience applause while watching the action of Dede Suryana dance with his skateboard on the waves of Cimaja Beach. The sounds of uniquely Cimaja Beach waves, and the laughter of small children playing on the beach. They seemed mesmerized by the sound of the waves. Every now and then they laugh as the sprinkling of sea water wets their face and body. 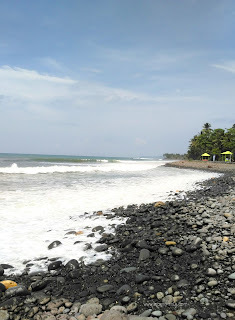 This beach is located in the village of Cimaja District Cikakak Sukabumi #JawaBarat. Approximately 10 kilometers from #PalabuhanRatu. To reach this location, if taken from the city of Jakarta, the distance is about 120 kilometers. 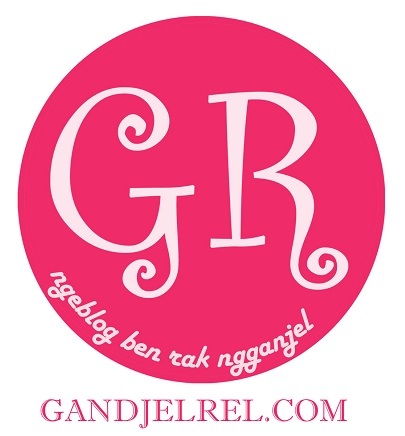 Distance will be further if you are in the area of ​​Bandung which is about 203 kilometers. 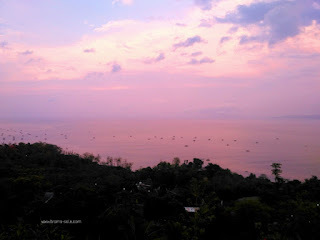 It is said that the name of Cimaja Beach is taken from a village where the beach is located. 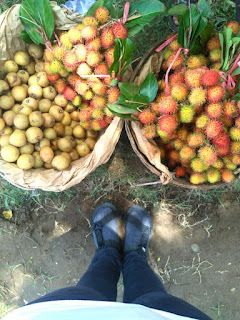 The village is named Cimaja Village located in Cikakak subdistrict Sukabumi district, West Java. In addition to the waves, this beach also presents another beauty in the form of rows of rocks neatly arranged with natural beauty and elegance. 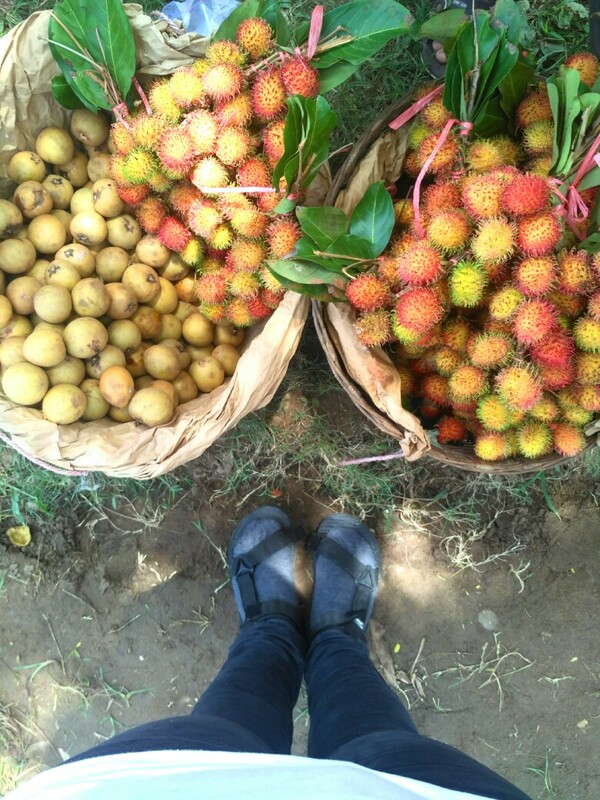 The surrounding community used to call it Karang Papak. 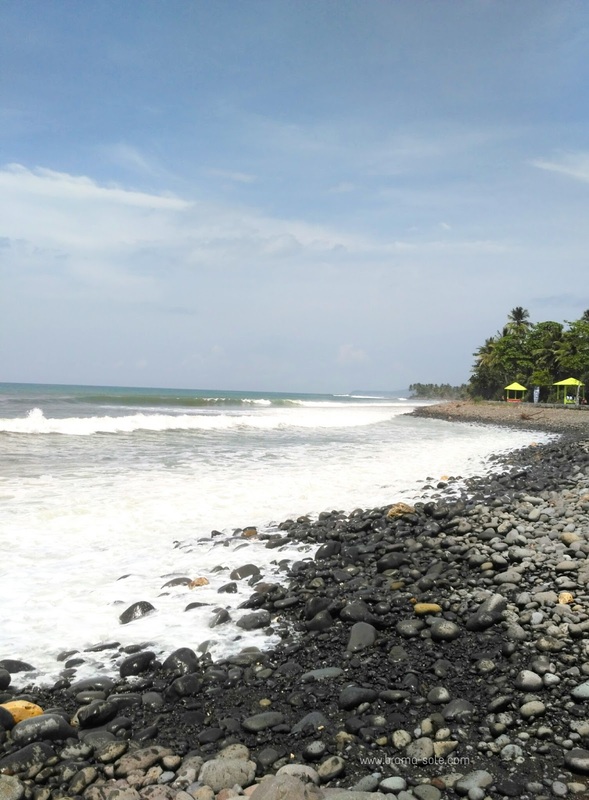 In my hearing perception, the waves at Cimaja Beach provide a memorable experience that linger forever in the heart of traveler. The Magical Sound of Kampung Adat Kasepuhan Sinar Resmi. The sound of music that still seemed strange to the ear greeted me when I reached the Kampung Adat Kasepuhan Sinar Resmi. I walked closer to the sound source. Three people dressed in black were carrying a large yellow bamboo. Two large bundles of dry rice hanging on each end of the bamboo. The three men rocked rhythmically as they produced magical sounds of bamboo friction that carried the bonds. The magical sound combined with the sound of the women pounding grain in the wooden mortar. All the choir immediately attracted the attention of the visitors who come to Kasepuhan Sinar Resmi. After asking some people from Kampung Adat, I learned that the name of the art to welcome the guests was named as Gegendek. Gegendek is music created from the sound of halu wasps on the lisung. Gegendek music can be created when some people, especially mothers pound grain into rice with a certain rhythm. There is also another interesting sound, namely Angklung. Music Angklung is the soul for every ceremony in Kasepuhan. Meanwhile, the music that sounded when I first arrived named Rengkong. Rengkong is one of art that was born and developed in agrarian Sundanese society. 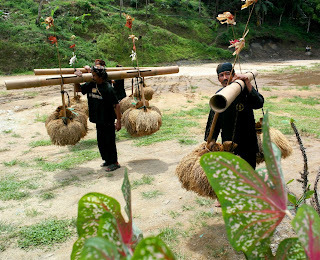 Rengkong itself is a traditional tool used to carry rice harvested. The tool is made of bamboo along two meters. 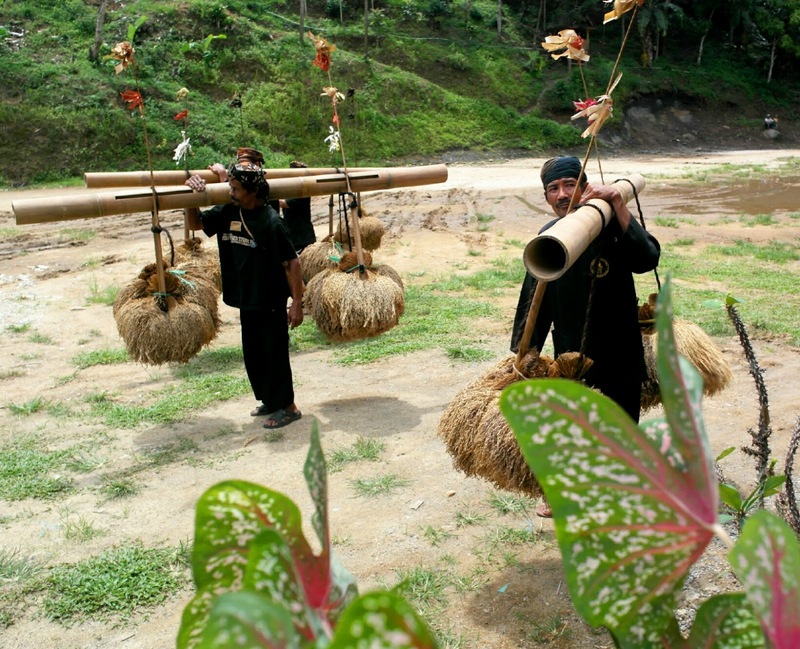 Bamboo is tied with a rope or Ijuk to lift the bonds of rice. The magical sound, comes from the bamboo friction with the rope. You can also listen to the sound of magical sound in Kasepuhan Sinar Resmi here. Kampung Adat Sinar Resmi is located in Sirna Resmi Village, Cisolok Subdistrict, Sukabumi Regency located between the border of West Java and Banten Province. Thus belongs to the category of the Adat area known as "The Unity of Banten Kidul Kasepuhan Sinar Resmi". The story of a visit to Kampung Adat Sinar Resmi does not stop at the exploration of magical sounds of typical arts of indigenous peoples, there are still many explorations of experiences involving the other five senses. But I will tell that part separately. 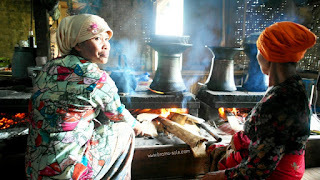 The Smell of Hawu in Kampung Adat Kasepuhan Sinar Resmi. 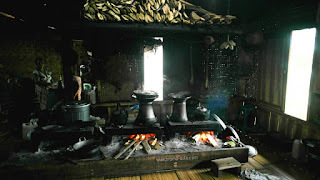 Have you ever entered the traditional kitchen, where there is still a traditional fireplace furnace made of firewood? If you ever go into that kind of kitchen, definitely you can remember how its distinctive aroma. The aroma arising from the smoke of burning firewood, hot charcoal, and bay leaf spices hung on the kitchen wall. Those are some of the scents I can remember in my visit to the kitchen of Imah Gede at Kasepuhan Sinar Resmi with AGAT 2017 troupe. Hawu or kitchen is the heart of Imah Gede. This is where the warmth and intimacy begin. When Kasepuhan get a visit from tourists, then Hawu will be the center of activity for the Elders. Steam from warm cooked rice in the traditional way fills the air in the kitchen. Kampung Adat Sinar Resmi is an organic rice producer. The rice fields in the area are traditionally tilled without the involvement of chemical elements. The result is brown, purple, black, and white rice with natural fragrant. The smell of organic rice when cooked in a traditional stove is different from the rice we cook with rice cooker. There is a ritual called Nganyaran or Nyangu Pare Anyar, the procession of cooking rice grain into rice from freshly harvested rice grain. This ritual is performed in Imah Gede's kitchen by Abah Asep's wife with the guidance of the elders. 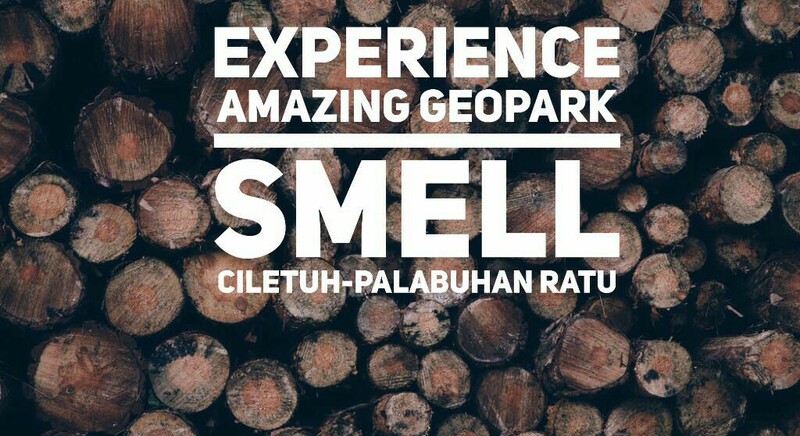 What we can smell in Kasepuhan Sinar Resmi, different from the air smell at Citepus Beach or other beaches in Geopark Ciletuh-Palabuhan Ratu area. 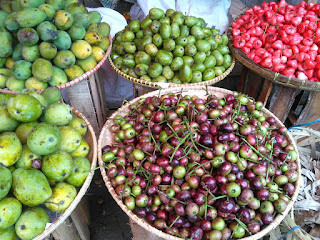 There is still a lot of scent exploration that I could do if I have three or four days to stay in the region. 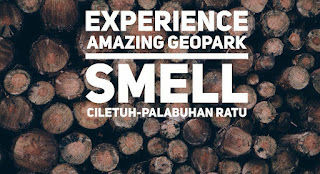 Based on information at the tourist information center #Ciletuh Palabuhan Ratu, there is an aroma adventure that I could experience, that is to smell the aroma of Raflesia Padma flowers in Halimun Mountain National Park. Maybe the adventure story could be realized one day. 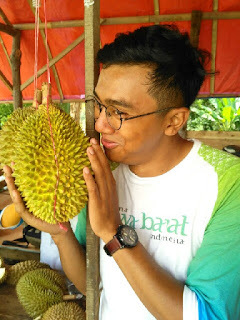 And don't forget to experience the smell and taste of Durian Cikakak. The Smell of Sulfur in Cisolok Geyser. Geyser in Cisolok District is evidence of magmatic and hydrothermal activity in South West Java. This activity is closely related to the process of plate movement. Geysers occur because of a combination of heat due to magma activity, water, and underground duct systems. As water passes through the canal to the surface, it releases the pressure that causes explosions and spews water into a geyser. Sometimes these springs also produce a yellow sulfur precipitate. Sulfur is what dominates the aroma at Cisolok Hot Springs. A number of hot springs can be found along the Cisolok River with temperatures ranging from 40-98 degrees Celsius and PH 7 so it is still safe for baths. 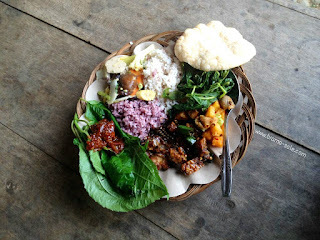 The Taste of Organic Rice in Kampung Adat Kasepuhan Sinar Resmi. Organic purple rice with its companion. Roasted Layur with Sambal Tomat. Cikupa in traditional market Palabuhan Ratu. After a walk to several tourist areas in the Geopark Ciletuh-Palabuhan Ratu, I have to invite you back to Kasepuhan Sinar Resmi because this is the unforgettable culinary experience that I have experienced. 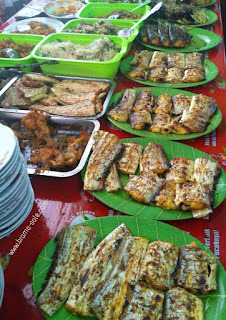 I've tried a dish in the form of Roasted Layur Fish sprinkled with soy sauce or tomato sauce at a food stall in Pasar Palabuhan Ratu. I have also tried the acid Cikupa fruit made into Rujak Bebek on Cimaja Beach, but no one can beat the delicacy of dining with organic purple rice in Kasepuhan Sinar Resmi. The key to the delicacy of a simple dish lies in the natural ingredients used. The fish and vegetables served are the result of the local cultivation. The process of cooking into a sacred ritual combined with a sense of warmth and kinship becomes a secret spice that is difficult to imitate by any restaurant. Directly Touch The Sites From Megalithic Age. If you want to touch and 'bring' home the knowledge of your travel journey in Sukabumi, it is mandatory to visit the Tugu Gede, Cengkuk Site. The place is located in the Cengkuk village of Cikakak district, Sukabumi This site is one of the archaeological site in West Java. This place began exploring in 2008. A number of findings in this area reinforce historians that the site was once the center of megalithic culture until the metal era. Items found in Cengkuk Village include stone monument or menhir, bath stone, stone chair, stone stone, stone resembling dining table, stone bed, etc. Although the journey to this site takes quite a while and the struggle to penetrate the terrain is not easy, but the experience and knowledge gained is very comparable. Traveling to the Cengkuk Site gives you experience in nature real life contact. During an open car trip, the wind stroked our hair and skin. Arriving on the site, our hands can touch the cold and hard rocks of the site. 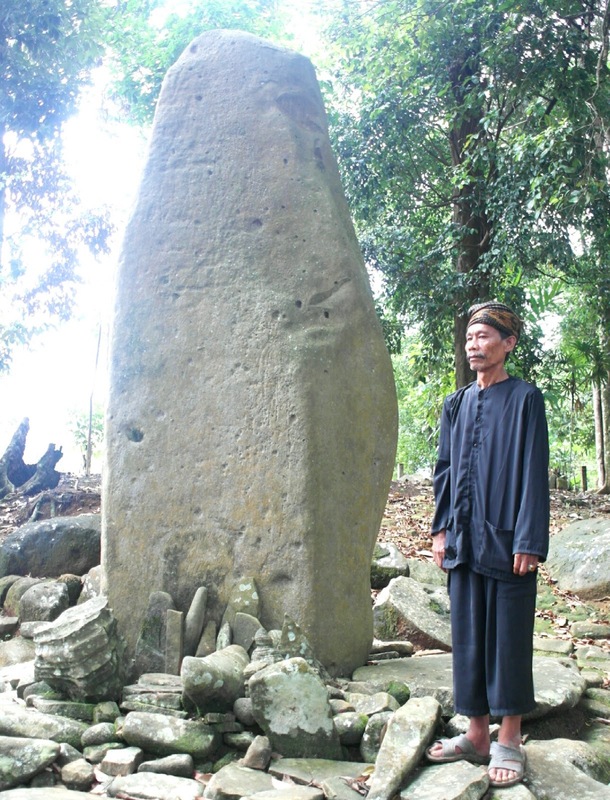 While listening to Abah Jaya's explanation, our minds are intrigued by various questions and guesses that make us want to be able to ride a time machine to see for ourselves how people in the megalithic age live. At least, if it is impossible to climb the time machine, we will be moved to touch back our forgotten history books. So that's the story of my journey that is so rich in experience so that five senses store their memory. The Geopark Ciletuh Palabuhan Ratu Area is so vast and rich that there are still many forms of exploration of other senses that you have to experience yourself. Wah, asyik banget pelesirannya, Nia. Makasih ya udah diceritain. Aku belum beruntung, mungkin kali lain. 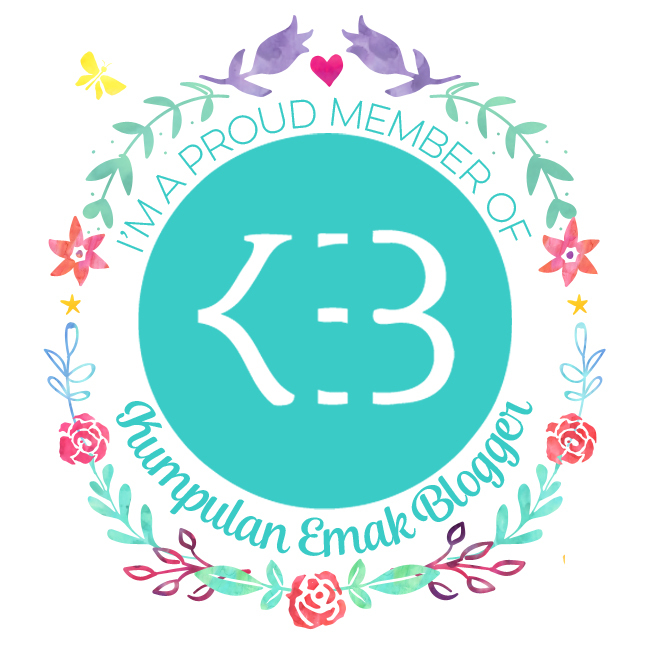 Semuanya menarik, budaya lokal, kulinernya, bentang alamnya, situs budayanya terutama pasar tradisionalnya. Kereen!